Lost amid the cacophony of saber-rattling and chest-thumping in Washington and Brussels is the quietly emerging, and infinitely dangerous, military deployment in the Black Sea. Once seen as a no-go zone for the US and NATO, the Black Sea, with its expansive Russian shores, has recently become the site of a slew of provocative military moves by the US, and equally significant counter-moves by Russia. Adding fuel to this potential fire is the participation of Chinese naval assets in this quietly brewing cocktail of global conflict. The presence of US military assets all throughout the Black Sea region is undoubtedly provocative as it is pushing perilously close to Russia’s borders. The potential for escalation – premeditated or otherwise – puts the entire region, and indeed the entire world, at risk of catastrophe. This article will focus on the US-NATO military developments in and around the Black Sea. While by no means a comprehensive listing of all of Washington’s moves in the region, it is an attempt to provide a glimpse into a little discussed theater of deployment for the West – one that is regarded as a very serious threat by Moscow. There is no doubt that US strategy vis-à-vis Russia places tremendous strategic importance on maintaining and expanding a robust military presence in and around the Black Sea. Recent moves by the US-NATO military forces make this fact all the more apparent. Having deployed a significant amount of forces to littoral countries, as well as initiating a series of critical military exercises and drills, Washington is demonstrating unequivocally its commitment to escalating the conflict with Russia. Nearly a year ago, in June 2014, former Defense Secretary Chuck Hagel laid bare US intentions. In the wake of President Obama’s public announcement of $1 billion to expand the US military presence in Eastern Europe, Hagel stated that the billion dollar commitment was for a “stronger presence of US ships in the Black Sea,” and that “[The US] will sustain that tempo going forward.” Put in slightly more understandable terminology, the US committed a significant monetary investment to the permanent expansion of its military presence in and around the Black Sea. The permanence of this new commitment is what is striking because, unlike much of the bluff and bluster from Washington over Ukraine and related issues, this represents a military deployment with real tactical value. It is not mere rhetoric, it is military escalation. And, in the year since the announcement was made, this process has evolved in earnest. Noble Partner will support Georgia’s contribution of a light infantry company to NATO Response Force, or NRF… The exercise will focus on unified land operations … Exercise Noble Partner provides an opportunity for the U.S. military to continue its training relationship with the Georgian Armed Forces as the sponsor of Georgia’s participation in the NRF. The NRF provides a rapid military response force to deploy quickly, wherever needed…. Exercise Noble Partner will include approximately 600 U.S. and Georgian Service members incorporating a full range of equipment… Georgian forces will operate alongside U.S. forces with their BMP-2 Infantry Combat Vehicle. The exercise will consist of both a field training exercise and a live-fire exercise. Fourteen Bradley Infantry Fighting vehicles and several wheeled-support vehicles, roughly 748 metric tons of steel and rubber, cut across the Black Sea…bound for the port in Batumi, Georgia, May 2. This is the first time that the U.S. Army has deployed a mechanized company worth of equipment across the Black Sea. The equipment will support the 2nd Battalion, 7th Infantry Regiment, 3rd Infantry Division Soldiers, participating in Exercise Noble Partner. Taken in combination with Hagel’s comments a year ago, it is clear that the US is committed to escalating its military presence in the Black Sea. Of course, it is self-evident that such a strategic development must be seen as an attempt to both outgun and intimidate Russia in its traditional sphere of influence. Trident Joust should be understood as an attempt to prepare NATO’s military architecture for possible rapid deployment in the Black Sea region, ostensibly as a defense against so-called Russian aggression while in reality seeking to expand NATO military capability against the backdrop of the war in Ukraine and increased tensions with Moscow. There are other important military moves that the US-NATO have made in the Black Sea in recent months, all designed to send a stern warning to Russia. NATO’s Standing NATO Maritime Group Two (SNMG2) recently completed its training exercises “designed to improve interoperability and enhance rapid integration of Alliance maritime assets… The force trained on anti-air, anti-submarine and anti-surface warfare procedures during separate exercises with the Turkish, Bulgarian and Romanian navies.” As part of SNMG2, NATO deployed significant military assets to the Romanian port of Constanta, not coincidentally a short distance across the Black Sea from Crimea and Russia’s fleet at Sevastopol. Participating in the SNMG2 was the USS Vicksburg with its Mark 41 Vertical Launching System, Harpoon anti-ship missiles, and arsenal of guns. In addition were Canadian, Italian, and Turkish warships, all carrying significant firepower of their own. Aside from these specific sets of naval exercises, the US has had major assets in and around the Black Sea to participate in a series of one-off maneuvers and a variety of drills in the past year, even before Secretary Hagel’s public announcement in June 2014. These include the recently decommissioned USS Taylor which spent much of 2014 in the Black Sea. Perhaps not so coincidentally, this US frigate is now slated for sale to Taiwan in a move that is likely to be met with disapproval in Beijing. 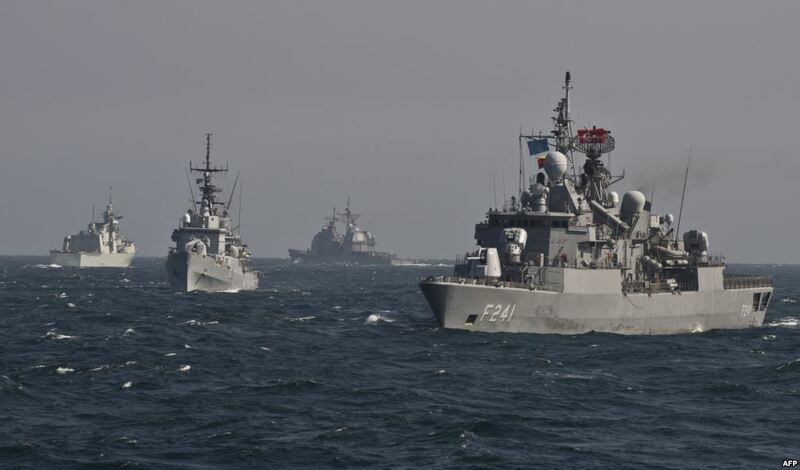 Additionally, the USS Donald Cook, a missile destroyer, conducted exercises with the USS Taylor and Romanian Navy. Also, the USS Truxton and USS Vella Gulf both logged significant time in the Black Sea in 2014, undoubtedly motivating Russia to move quickly to ramp up its naval and military capabilities. It is interesting to note that Russia’s moves in Crimea in 2014 came within a matter of days of the entrance into the Black Sea of these US naval assets. Anyone who doubts that Moscow’s decision to support Crimea’s vote for reunification with the Russian Federation was motivated by something other than military and strategic pragmatism would do well to examine this timeline of events. All of this makes plain that the US and its NATO arsenal are gearing up for a “pivot” – to borrow the grossly overused terminology of the Obama administration and the Pentagon – that will see their forces focused on the Black Sea, just as they have shifted attention to the Baltic Sea even more so in recent months. It does not take exceptional powers of deduction to see what the US intends: continued escalation, force preparedness, and intimidation against Moscow. However, it is equally apparent that such provocative moves raise the risk of a misstep, an accident or misunderstanding that could touch off a major military conflict. Considering the players involved, such a blunder could spark World War 3. A forthcoming article will focus on the countermoves that Russia is employing to confront US-NATO aggression near Russia’s borders. The article will focus specifically on the fast-developing military relationship between Russia and China.